The National Agricultural Export Board (NAEB) says giving coffee growers plenty and essential support, including fertilizers and pesticides as well as helping revive collapsed cooperatives, are part of a grand scheme to boost production in the country. This comes following recent and encouraging market developments, especially with local growers upbeat about benefits of the new partnership between the Government and the Alibaba Group to facilitate electronic trade in Rwanda and Africa. Coffee growers and exporters see the Alibaba deal as an opportunity to broaden their market by trading online and directly attract buyers in the huge Chinese market. Pie Ntwari, NAEB's Communications Manager, said: "We give to farmers any necessary support to improve the sector's development, including fertilizers and pesticides. We also provide capacity building initiatives and advocacy. "We have turn-around programmes which are meant to uplift stagnant or collapsed cooperatives so that they can come back into the loop". Total coffee production from July 2017 to June 2018 increased by 3,520,769 kilos, equivalent to 19 per cent. This is, according to NAEB's June 2018 report, mainly attributed to good rain and fertiliser applied in the previous season. "Coffee production realized from July 2017 to June 2018 accounts for 95% of the target. Performance is above 90% of the target which is a good indication of achievement," reads part of the report. "Coffee revenues realised from July 2017 to June 2018 were achieved at 99% of the target. This achievement is influenced by good average prices compared to the previous year and increased export volumes by 10%. In October, Rwanda coffee scooped two international awards - "Best of the Best" and "Coffee Lover's Choice" awards - in the third annual Ernesto Illy International Coffee Awards. David Rubanzangabo, a coffee farmer in Huye District who harvested 1,200 kilogrammes of coffee on his three hectare farm in 2016, says local growers' partnership with NAEB was bearing fruit. "The partnership with NAEB helps us [farmers] maintain or improve quality. They provide, us with pesticides and fertilisers. They also give us advisers at the grassroots level," he said. "They have redently given me half a tonne of fertiliser. And then there is a nursery bed with 40,000 seedlings; I will take 20,000 and the rest will all go to small acreage farmers in my neighbourhood". 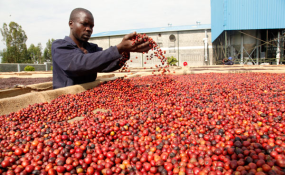 Coffee, a key export crop in Rwanda, has contributed an average of 24 per cent to total agricultural exports over the last decade, with more than 400,000 farmers deriving their livelihood from the crop. Last year, NAEB indicated it had started a new countrywide campaign to boost coffee production and consumption, as part of the 2017 Rwanda Coffee Day then held under the theme "Gusangira kawa y'u Rwanda tubigire Umuco Iwacu!" Three local coffee exporters were selected in July by Alibaba as part of a pilot project to sell Rwandan roasted coffee directly to Chinese consumers. The three Rwandan coffee brands in the Alibaba's e-commerce platform are Gorillas Coffee, Rwanda West Hills Coffee, and A Thousand Hills Coffee. Benjamin Nkurunziza, sales and marketing manager of the Rwandan Farmers Coffee Company, said the project is "going on very well" and there is hope it will expand in the near future to bring in more exporters. "Our brand name is Gorillas Coffee. We have sold twice to them, late August and in October. We expect the demand to increase as China is such a big market. Their expectation is also high and we could sell more. We will make sure we are ready when the next purchase order comes," he explained.